We had an amazing turnout to hear Charlie Dent speak to our group yesterday. As a souvenir, he left behind a copy of the letter he and other Republican lawmakers sent to Paul Ryan. Take a look! 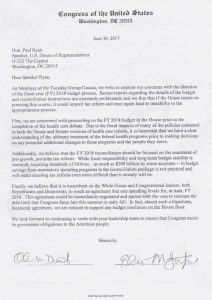 The House Budget Committee has called for $200 billion in cuts in entitlement and other spending; in early July, Dent led 20 House members, mostly Tuesdayers, in a public letter opposing the staunch cuts.